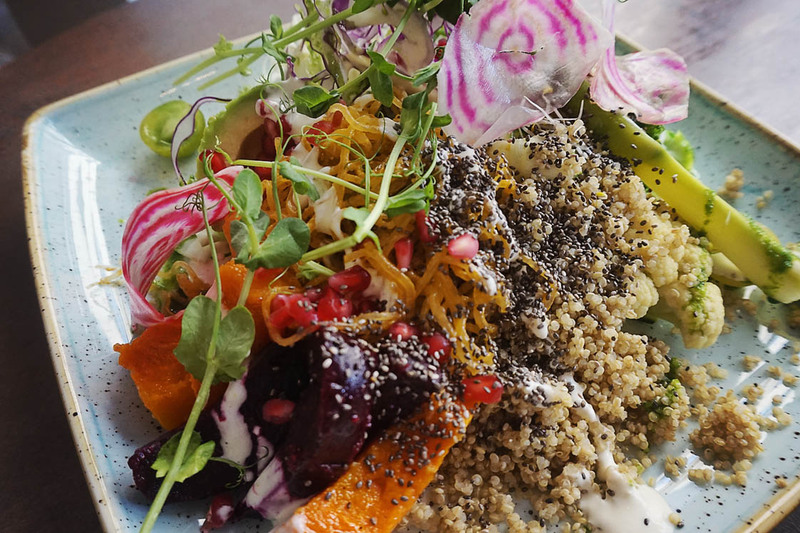 Our talented team rider Jessica has been active in the kitchen and come up with this yummy super-food lunch, jam-packed with healthy veggies and quinoa. Herb dressing: A handful of basil, arugula, chive, spinach, parsley and olive oil. Lime och ginger dressing: Lime juice and zest, grated ginger, garlic, salt and pepper, soya yogurt and a little agave syrup. Sea grass noodle dressing: Cherry tomatoes, spring union, basil, garlic, olive oil. Roast the butternut squash and beetroot in the oven at 200° until soft. Cook the quinoa and seaweed noodles per package directions. Blanch the broccoli and cauliflower. Plate the squash, beetroot, quinoa, seaweed noodles, broccoli and cauliflower. Top with some shaved zucchini, roasted pumpkin seeds and raw chia seeds. The dressings to top the salad with are made in a blender and can be tasted and altered according to your taste preferences.